Discussion in '2nd Gen. Tacomas (2005-2015)' started by EvilBetty, May 10, 2007. I just sold my 1994 Pickup for $2K one day after putting signs in the window. Never even listed it anywhere. I had 8 calls on it today just from passers by. I could have gotten more out of it I think but it got a good home. I'm going to miss that little pickup! Wow. Great shape for a 1994. Something like that would fetch over $5K around here. Man! I wish I had $2K. I would definitely have given you $2K for that truck. 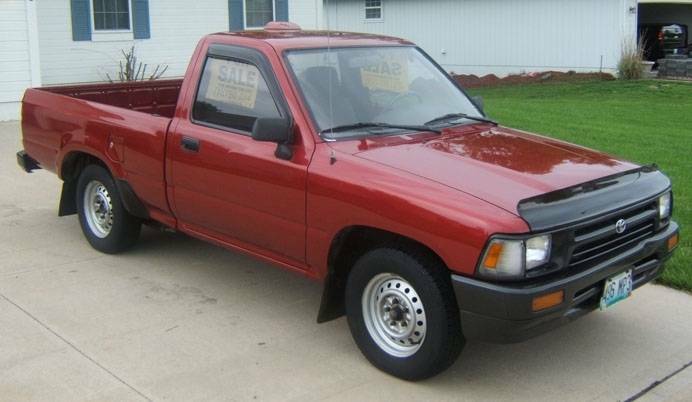 Hopefully I will find a 4x4 truck for ~$4K in the next two years (I need a toyota). Congrats on selling your truck! Very impressive. I would have paid more for that. It looks like it is in excellent condition. It would have made a perfect DC road car. It wouldn't look the same after 4 months here. Nice pickup. Definetley worth 2000 . I remember when I sold our 89 SR5 4x4 22R-E, I was bummed for a while. The 22RE motor was bulletproof and returned over 20 mpg. That was with 32" tires. Hope I don't get flamed for this but I think the build quality of the Pre-Tacos was better then the current Tacoma pick-ups. It was a 2WD/4cyl/5spd reg cab. It had no power anything, no A/C, and a 144K miles on bald tires. But yes it looked and drove fantastic. Other than a couple small dents and a cracked 3rd brake housing from an ice sheet this winter flying off a semi. KBB was putting at $2400 with good tires, and Edmond's was putting it at $1400. I was going to list it in the paper and on Craigslist for $2600 but this guy kept me from having to field numerous phone calls and race home for test drives, and I never did anything but put signs in it a day ago. If I could have seriously gotten $5K for it I am kicking myself right now. Nice pickup. Definitely worth 2000 . Hope I don't get flamed for this but I think the Pre-Tacos were better made then the Tacomas. The 22RE motor was bulletproof and returned over 20 mpg. I'm sure I'm weepy because I had this truck for 8 years. Longest I ever had a vehicle before that was maybe 2 years. They just didn't last beyond 80K. I never had anything major go wrong on this truck. I changed a starter, brakes, and a thermostat, and besides oil, that's it. If the engine and paint last that long on my new TACO... I'll be one happy permanent Toyota patron. I am hoping for the best but I would love to be able to go back and buy a solid-front axle 22R or 22RE 5-Speed 4x4 Toyota. It's in evilly good shape for a `94...hmmm!